My weekend of celebrating with the folks was excellent. And sure enough, my mom (known to many of you as Grandma G) embarked on a DIY deodorant project. She came across someone selling homemade deodorant nearly a year ago, tried it out, and found that it actually kept stinkiness away better than store brands. Plus most popular brands of deodorant contain aluminum, so if you can avoid stuffing metal into your pores, that seems like a good idea. After using a few types of natural deodorants and figuring out which ingredients she prefers, Mum decided to make her own. Here's the recipe we arrived at this weekend. To apply, scoop up a bit with your finger, hold it against your skin for a couple seconds so it melts a little, then rub around. The recipe above should last 4 or 5 months. We bought all the ingredients at Whole Foods. A jar of coconut oil is shelf stable for two years, who knew? So this stuff ought to provide a couple years' worth of deodorant. Try using any essential oil scent you like, but pick something that smells good mixed with coconut—the coconut oil contributes scent, too. Update: Mum sent some notes to address questions in the comments. "IT WORKS! Best deodorant I've ever used... beats store-bought hands down. Needs only be applied once/day. In fact, I once went 3 days without reapplying (don't ask why), and still no odor. One recipe I found did not include essential oil, but essential oils have antibacterial properties, and bacteria is what causes the odor. You could try leaving it out and see how it does, if you want. The baking soda is also to absorb odor. The coconut oil scent is very light and fades fast after applying. I don't smell it at all on my underarms... just a light grapefruit oil scent. I don't know how much you'd smell the coconut oil if you didn't add essential oil, however. You could try cornstarch in place of the arrowroot powder, which is mainly to thicken and absorb moisture. I don't know if there'd be any difference or not. A commentor brought to our attention that cornstarch may contribute to yeast infection, so I would recommend using arrowroot powder if possible. I have never had a problem with this deodorant leaving marks on my clothes. The oil is pretty much absorbed into your skin. You could try waiting a bit before getting dressed for it to absorb, if your underarms feel oily. Just remember... it doesn't take much for it to work. As for adding vodka, I have no idea! I don't sweat heavily, so it's kind of hard for me to say how well this recipe works as an antiperspirant, but the description of the original stuff I'd bought said that the coconut oil is water proof, helping to seal in the sweat. I kinda have my doubts on that. But you "heavy sweat-ers" will have to let me know. Please post back with comments on how well it works for you. I'd love to know!" Update #2: If your new deodorant is making you itchy, read this helpful article about pH balancing. so it really works??? you just rub it on your pits? i feel like i've tried every natural deodorant out there and nothing really keeps the smell at bay. but this looks like it's worth a try! Hmmm... if you just like tje scent of coconut, could you leave out the essential oil? Or do you think you'd need to add that many more drops of the coconut oil to keep the moisture content the same? Um awesome! I will definitely try this out! Thanks! I don't really like the scent of coconut. Could I use something else or is it something about the coconut that works? Thanks! The essential oil is a lot runnier than coconut oil, which is more like the consistency of margarine. The essential oil did seem to thin the mixture a bit, so you probably could add a little more coconut oil to compensate. The essential oil is only there for the scent. Just keep adding stuff until it seems about right. How's that for scientific? Coconut oil is a everyday item in Indian households. (We use it for oiling our hair and for cooking too). If you have an Indian grocery store around, you can find scented cocunut oil there. This *might* be good enough for people who dont like the natural coconut oil scent. New reader here. You have a lovely blog! This isn't going to work as an antiperspirant though, is that right? And I wanted to add that the coconut smell does not linger, and is not overwhelming at all. Thanks for the post! I think I've seen odorless coconut oil where I buy mine. I wonder how grapefruit seed extract (mine is Nutribiotic) would work, it has natural antibiotic qualities. This recipe looks good. 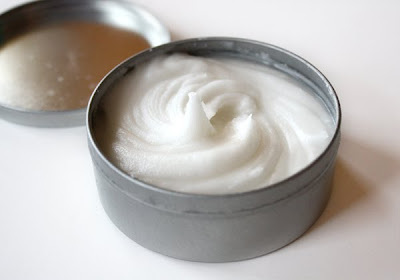 I make my own deodorant too, but use cornstarch instead of arrowroot. Good to know. I also use a bit of coco butter and vodka. The vodka seems to help evaporate the sweat a bit. It's pretty bloody hot here in AZ so any help getting rid of sweat is a plus. And I can vouch for this stuff working I use it everyday and so far no one tells me I stink, plus I add a bit of lavender so I smell pretty lovely. I use the NOW brand coconut oil from Fruitful Yield on my skin and hair...it's not the cooking oil, though. Mine is in the beauty aisle and it has no coconut odor, just a very light "fresh" scent. It's also less sticky than the cooking oil (I tried the cooking oil once because it's cheaper, but it's also *much* stickier). I will try this! thanks! I'm pretty tired of smelling like a health food store from using all natural deodorants, and don't want to use deodorant with aluminum. Thanks SOO much for sharing! At this moment I have four different kinds of 'natural' deodorants on my dresser. And I can honestly say, I do not smell very nice at this moment. Nothing works. I am also allergic to metals. I can't wait to try this!!! Thank you so much. Wow. I am super tempted to try this! This is so interesting! Does it work well? Is it only used to deodorize? Does it stop sweat as well? Great! Maybe I'll try it out! what an interesting post and comments. Your recipe makes a lot of sense to me, and I like the idea of adding vodka for "anti perspirant" qualities. Thanks for posting this. My husband has been on the hunt (okay--I've been on the hunt for him) for some aluminum and "fragrance" free deodorant. I can't wait to give this a go! Totally cool, does it work?! Also, does it leave yellow marks on your clothes? Hi, everyone. Yep, I spent the day in the car and am too tired to address all the questions tonight. I'll sleep on it, and tomorrow I'll email Jess some answers and info, and then maybe I can get her to update the post a bit. Sounds great! Must give it a try. I've recently made Amy Karol's (Angry Chicken)deodorant and it works really well too! OMG! I am so in love with you right now for posting this. Do I only have to apply it once a day? I'm using natural ones to avoid ingredients such as aluminum and talc. They seem to work for 2 or 3 hours...but I'm most of the time embarrassed about the way I think I smell to others. Yet, feel better off stinking rather than making higher chances of cancer or some other risk. I'll check back for your response...but probably before then will have my answer as I am going to immediately go get the two ingredients that I don't have on hand which I need for this recipe. what?!! no Aluminum Zirconium Tetrachlorohydrate? Looks like a good recipe. I would suggest you could omit the essential oil and use a squirt of your favourite perfume instead as your odourant. You can always add more later on in the day too and it feels really refreshing too. Tea Tree Oil is also a good as it is antiseptic, antibacterial and anti fungal but maybe it wouldn't mix so well with the coconut smell. This sounds really great, thanks for posting it! My hubby always jokes that women should wear cookie scented perfume to attract guys. Cookie scented deodorant could just be the ultimate multi-tasker! I really likes your blog - it is so inspiring and I also like the tutorials and your tips for free downloads. Thanks to that I found out about Teris Paper Dolls - I really love them and had to write about it on my blog. Your blog is from now on one of my favourites! hmmm, may need to experiment. My biggest problem isn't that I get stinky, but that I sweat like none other... Vodka as an anti-perspirant is an interesting idea! I'm sure this works fine on the deodorant front. But last time I tried using baking soda alone for a deodorant (admittedly very long ago) it worked great, but I eventually developed a bad case of underarm fungus. Made my hair look red and kind of crusty (eeeuw!). Fortunately, the environment went back to normal fairly quickly when I stopped. Is there a specific reason for using arrowroot powder as a starch? Do you think you could use any other starch? Wow, thanks for this idea, I will be doing this for sure, I have all the ingredients right now :) Thanks Grandma G! Very cool, you made a cream deodorant. I think I'll have to give this version a try! I make a similar one that's just a powder. Equal parts baking soda and corn starch, and a bunch of anti-stink oils. I use tea tree for its anti-bacterial properties, along with lavender, peppermint, and sometimes lemon oils, and apply it to a damp pit (damp with water, not sweat! eeewww) with a powder brush. Lila - it's the antiperspirant ingredients that turn your shirts yellow. Ew! I don't have any coconut oil right now but I'll be heading out for errands tomorrow & add it to the list. Thanks for the new recipe to try out, Grandma G & Jess. Super good! I'm going to try this! My hubby can't use commercial deo and this might be just the thing! My mom just sent some additional notes answering questions, which I've added to the post. Hope that's helpful! Can I use coconut in the liquid form? the pic shows a semi-solid but I don't have that;I only have the liquid type. Arrowroot and coconut oil are even cheaper at Amish grocery stores. We go to E&S Sales in Shipshewana, IN. That's quite a drive from Chicago, I know, but if you ever come this way, you should check it out. Just ran out this AM and was dreading the loooong drive out to the natural food store. YAY! I actually have all these ingredients in the house! Thanks a mil for posting. We used this for several months and then had to stop-it gave us a yeast infection in our underarms-red and irritated. I miss my homemade deodorant. I now use Aubrey organics for men-pine,-love it. the pine scent disappears when it dries. It keeps me smelling lovely all day. Me and hubby are going to make it this week! He quit all deodorant and now just uses pure aloe vera gel and it works wonders for him, but we both can't wait to try this. As for the yeast infections for some people, what if you use a little of the Summer's Eve type wash for women's personal parts? :) I haven't had a yeast infection in 5 years. So in the shower just swab it over the arm pit. Should help. I'm going to try this! So far, I've had trouble finding a natural deodorant that I really like. Thanks for sharing! i'm game to try! tried everything else! Whoa, this is exactly my setup when I make this for myself. I have used this for about 2 months and love it! I do sweat but don't stink. Here is some info from my experiences of making my own natural home and bath products. I also have been using essential oils for years. First off, be cautious with any citrus essential oil as it can contribute to sunburn. Definitely a concern if you wear sleeveless shirts. I've been wanting to use lime essential oil but have been reluctant for this reason. Next, I have read on several occasions from different sources that cornstarch can cause or contribute to yeast infections, so I avoid it all costs. Arrowroot is a good choice, or at least for me. Now, why coconut oil? Supposedly it has antimicrobial properties when it "mingles" with our natural and normal bacteria we have on our skin. I think that's what prevents the "stink" factor. Extra virgin unrefined is preferred and is recommended for skin application. "Google" coconut oil and once you read about the benefits, you'll end up using it for everything, I know I'm hooked. Lastly, coconut oil is solid at room temperature to about 76 degrees F and then it melts. So you may want to store your deodorant in the fridge to keep is solid. I hope this helps. 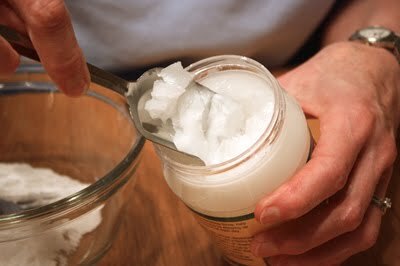 Don't be turned off by the cost of the coconut oil, it is a great skin moisturizer all by itself or makes a great exfoliant when mixed with sugar (I love brown sugar) for a sugar scrub in the shower. wow!!! that's so cool!!! Thanks for sharing! Coconut oil melts at 76 degrees, and the rest of the stuff would be much easier to mix into melted oil, so I would melt the oil first (If you don't want to use the stove, just about any warm spot in your house will do). I have heard of this before, and am waiting for our current container of deodorant to run out to try it. By the way, some folks just refill an empty deodorant container with this mixture. Also, coconut oil is totally yummy to cook with, and very good for you. It's available much cheaper in larger amounts onliner. it works! my daughter and i made some last week and have both been wearing it every day. we love the smell (added grapefruit, lemon, and wild orange oils from doterra), and the coconut oil smells wonderful too (purchased the 365 brand from whole foods). you do sweat still, but you have to wonder about anything that can totally clog you up and stop you from sweating. not good. i love this deodorant! i always use natural and i think this concoction is my favorite so far! I'm late on commenting, but for good reason. I did it! I followed the recipe, substituting sage for grapefruit essential oil (in the hopes it would be more unisex in scent). I melted the coconut oil a little, because it was definitely easier to mix that way. The whole thing only took about 5 minutes to make -- really easy. And it's a hit! We live in North Carolina where it's been 80+ for the past few days, and I'm a "sweatier" type of person. This works much better for me than most of the brand name aluminum-free deodorants I've used (e.g. Tom's). And it's definitely cheaper, considering how much I can make with such a small amount of each ingredient. The only problem is that I find myself smelling my armpits way too often... because I LOVE the way the sage smells with the coconut (which is so faint). It's just fantastic! I'm going to make some for my mom, who LOVES this sort of thing. She's going to be thrilled. :) thank you!!! Yay! Glad to hear it. And there's another happy report here from my high school buddy Heidi, who tried it, too. I made up a batch of this last night, using cornflour (which I think is the same as corn starch) instead of arrow root. I added lemon and tea tree essence to the warmed coconut oil and mashed in the other ingredients but the result was never creamy - it was more a sort of powdery consistency until I pressed it into a small china bowl where it set quite hard. One of the pics I saw, I think it was Heidi's, showed a creamy/whipped-up type finish which looks completely different from my powdery one that just sticks together if you mould it - a bit like when pastry is ready for rolling! This morning, on first use, I had to sort of scrape out a powdery chunk with my nail (a bit bigger than the size of a peanut maybe). I rubbed this between my hands but again it stayed powdery - there wasn't any oily residue at all, so I've no idea if that means I haven't got the mixture quite right. Anyway, I'm sitting here sniffing under my arm every so often and I smell gorgeous, even if I didn't quite get the consistency right! You could maybe try adding more coconut oil to your mixture if you want it creamier. See if that helps? We have been using this natural deodorant since we found out we were allergic to corn. This works very well for us and we are in humid Mississippi. In the beginning I mixed up this combo because the coconut oil is anti-fungal (and I knew it was absolutely corn-free) and the arrowroot powder was for absorbing sweat and the baking soda was for neutralizing the acidity of the sweat. I didn't realize this was a deodorant recipe at the time, it just made sense. We really love this deodorant alternative but don't add any essential oils (nervous about corn contamination) to ours. I suggest that everyone buy the best organic virgin coconut oil you can afford and use it for cooking, too. It makes a great healthy alternative to shortening and it is also the best moisturizer I have ever used on my face. Also, I would not suggest using cornstarch since any cornstarch you buy will be made from GMO corn and it does promote yeast growth. Thank you so much for this tutorial! I used Violet oil (also from WF) and love this combination. 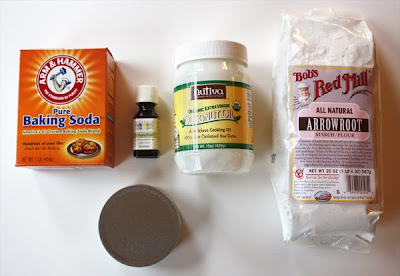 I use a similar recipe (baking soda, coconut oil, vitamin E, cocoa butter) and it works great - it won't stop you from sweating, but it will stop you from smelling! Coconut oil is a solid at temps lower than 76F. You can just mix this up and put it in an old deodorant dispenser and keep it in the fridge. It will melt once it gets to body temp, but it soaks in very rapidly. I use coconut oil (not the cooking kind, I also buy mine in an Indian-centric grocery store) as hair conditioner and it works incredibly well on hair damaged from dying it funny colors =D. I'm very excited to try this recipe for deodorant now, I would have never thought of using it for that. Thank you so much Grandma G!! I want to thank everyone for sharing your success stories with the deodorant. I'm happy to hear it's working for you. Thank you, too, to those of you who shared helpful tips, especially to "kc" for listing the properties of the ingredients... now we know why it works so well. Yes, it should work to put the mixture in an old deodorant container if you prefer applying it that way, because it does firm up nicely, even without refrigerating. Just don't let it get too warm or it could melt. He's a stinky guy and I have to say, as a wife with a hyper sensitive nose, he doesn't smell at all. This really is great stuff and he's been using it for years! Oh, and it's cheap, too! Hope that it helps all you paste phobic folks (and I am one of them - ick!). Elle... I've seen some on Etsy. Just do a search in 'supplies'. hmm. an interesting forum for discussing our pits. i think i'll stick it in my old deoderent container like someone suggested, so its not all over my fingers, that i stick in baby's mouth ..my fav deoderent is that of sage, lavender. Someone told me a couple of months ago that if a person has smell underarms they need to increase their magnesium intake. So I did and it really works. Magnesium Phosphate tablets from the health food store, take one a day. Needless to say I have always had a magnesium deficiency so that is probably also why my deodorant is not very effective. This looks like a good recipe. Cherrie in Australia on the coast where it is always humid in the warm weather. Oooohhh I can't wait to give this a try. Just one thing though... The coconut oil you have shown looks more like a thick cream and I don't think I've seen that here in Shanghai. (If I were in the Philippines, I might be able to get coconut oil as our yard is full of trees but...) So is there anything I can use as substitute or will other type of coconut oil (in diff consistency work)? Thanks a million for this. Ooooo, I can't wait to try this! I recently made Amy Karol's deodorant - http://angrychicken.typepad.com/angry_chicken/2008/07/homemade-deodor.html - and have had great success. It definitely seems more effective than ANY store-bought deodorant I've ever used, even after I work out. My one complaint is that I don't love the cocoa butter/shea butter scent that is prominent even with the essential oils, and I think I'd prefer the coconut oil for that reason! Hi Everyone--I saw this post and had to add a little information that I thought would be helpful. First, we should all be on the same page about what the difference is between a deodorant and an anti-perspirant. A deodorant relieves the stink from your body when you sweat. That's why there are a lot of deodorant body sprays (which are mostly alcohol). The alcohol neutralizes the bacteria in your skin and body hair that cause the stink BO smell. An anti-perspirant, on the other hand, keeps you from sweating in the first place. Most often, the minerals, like aluminum, block the sweat glands and keep that part of the skin from allowing the sweat to come out. So you'll notice that the deodorants that you see on the store shelves are often very similar in their contents to the antiperspirants with the exception of the aluminum and the addition of alcohol in the recipe. Next, (and I am sure there are people who will disagree with me) The link between aluminum in anti-perspirant products and cancer has not been proven. Personally, what would concern me more, if you're indeed concerned about aluminum in your body, would be consuming food that has been cooked on aluminum pans. Regardless, I respect peoples' desire to not have this ingredient in their bodies. Lastly, you may find the "soft solid" form of deodorants and antiperspirants works harder than the usual solids. Why? Because the softer form absorbs into your skin more readily. This is true of homemade and store-bought AP/Deo products. That's why the "clinical strength" versions of the stuff that's found in the grocery store are in soft-solid form. I hope you find this helpful. Good luck in your DIY adventures! Thank you very much, Anonymous Deodorant Expert. Much appreciated! I'm not sure if this has already been addressed but you can get unscented coconut oil -- look in the cooking oil section as well as cosmetics. And coconut oil is a great hair conditioner -- Sometimes it takes a couple of shampoos to get it out but it is amazing. Took my straw-like hair back to its shiny brunette self. As for deodorant -- I've used a similar recipe with corn starch rather than arrowroot and lavender and tea tree oil and it works great. Since entering perimenopause I'd noticed I was stinkier and had begun to despair of finding something that worked for me so I'm thrilled this did. I need to apply every day to be certain of keeping the stink away but it works great and doesn't irritate my sensitive pits the way some commercial antiperspirants did. The recipe will be runny in hot weather and hard in cold weather so make sure your container can handle both extremes [I cleaned out an empty deodorant container with a clicking mechanism and it worked great for summer but not at all once it was cooler]. Arlyna... I really don't know for sure. I would give your coconut oil a try. It might firm up when mixed with the other ingredients. Or you might have to add more dry ingred. Or you could try refrigerating it to see if it firms up. Don't be afraid to experiment a little, because I don't think the proportions are all that crucial. I just made my own last week. I used to love Lush's aromacreme, which they discontinued. I used baking soda, jasmine essential oil, rose absolute, cocoa butter, a little kaolin clay, gardenia essential oil, and some sweet almond oil. It works great, and I smell cocoa buttery instead of all yucky chemically like girl deodorants do. It beats the heck out of any natural deodorants, which never work in my experience. However, some people have found that the baking soda will give them a rash, which I think someone mentioned above. I feel fine, and the odor-free zone even lasts through a shower! Amazing! hopped on over from Jezze blog.Thanks for sharing this recipe for deodorant .I will have to try it.I think you have an awesome bog.thanks again. Just made up a batch of this and split it with my neigbor, she has been looking for just this very thing. When I made this up, it was alittle cool her in WI so I had to zap the coconut oil in the microwave for a few seconds to soften it up enought to mix well with the other ingredents. Looking forward to trying it out tomorrow. Any suggestions would be greatly appreciated!! Boy, I wouldn't know the answer to that one, Luree. My suggestion would be to do some internet searching to see if you can find an alternative. Sorry I can't be more helpful. Extra virgin olive oil has antifungal properties like coconut oil so I don't see why it wouldn't work. You could try mixing up a small amount to try. You may want to keep it in the refrigerator for ease of application, though. Thank you. We are trying to be frugal this year (or rather that should ready have to be frugal this year :) ) and I had been looking for an easy deodorant recipe. I love it. DH is not yet a convert but he bought his in bulk about two months ago so I can wait to convert him. I don't suppose you have a coconut oil soap recipe to share do you? Just made it, blogged it, love it! LOVE this! Found it through a friend but it's the same recipe. I will be blogging about it at organicbabysteps.blogspot.com. It works much better than I expected. I just made some homemade deodorant myself before reading your post! I like the idea of using coconut oil - I used raw shea butter, but the shea butter that I have is bright yellow. I will make some with coconut oil to give as gifts - bright yellow deodorant isn't as nice. So I saw this recipe on the same day I ran out of regular old deodorant! I considered it a sign, especially since I hate my deodorant anyway, lol. I take dance classes for fun and hate that no matter how much deo I put on it's never enough! I ran out today and bought all the ingredients so that I could put it to the test immediately - T-ball practice this afternoon. Full sun, 12 pre-schoolers, almost 90 degrees.... ughhh. But how excited was I when my sweat-soaked-self got back to the car to sniff!?!? Just a mild tropical coconut scent floating in the breeze, HA! Made me want a Pina Colada :) YAY for homemade deodorant! I'll never buy store stuff again! Thanks Jessica and Grandma G! I'm going to try this one. Already have all the ingredients on hand too. I've been looking for something without aluminum because of it's alzheimer's link...Alzheimer's is unfortunately a big part of my life. I've been using this for about a month now, and I just have to once again say THANK YOU for posting it. This has survived rush hour in a hot car, a picnic in near 90 heat, a night of clubbing, and today a bike ride in 88 degree weather. This recipe is just awesome. Super! Wow, where do you live, anyhow? It's 49 degrees here! I would like some of your 88. Sometimes I crack myself up the things I can get excited about and this is one of them! I just made a batch and used guava essential oil...it smells divine! I have a 10 year old daughter that is starting to mature and I have been hesitant to start her on store-bought deodorant (mostly because I just can't stand the thought of her growing up!) I also have a 15 year old son -- any suggestions for a more "masculine" scent? He keeps asking for AXE. Ugh! Your recipe is wonderful! I modified the basic recipe by popping the original mix into the microwave for a few seconds to soften it then adding a little extra virgin olive oil so that the mix wasn't so rock hard at normal room temperature. Works absolutely brilliantly. My stinky pits have been vanquished! And let me tell you, I'm a stinkier one. I LOVE this, and I'm telling all my friends about it. I would offer to have them smell my pits if it weren't completely socially unacceptable. (I had my fiance smell my pits last night - after a full day of work, plus a night class - he's sold.) I noticed that I felt a lot more confident and comfortable yesterday as I was sitting next to a co-worker showing her something on the computer. I love this stuff so much, I might even marry it. Yay, so glad to hear it!! I am about to make this and am very curious about the result. After reading all the comments I just would like to make everyone here buy organic coconut oil because for the production of that the rainforst is not being burned away! Coconut oil production is huge(it's in most cookies etc) and for that the rainforest is being burned away daily!! Please don't buy any arm and hammer product! Thanks, Grandma G for the tip. My friend from the US just brought me a couple bags of Arrowroot flour so I'm definitely trying this out this weekend! Shanghai is going to heat up really soon (yikes!) and need some "protection". Thank you very much for this recipe I made 2 batches and I have used my deodorant and Yes it does work.I have a very hard 9 to 5 job.At the end of 8 hours I was still fresh.The only thing im going to try adding coco butter to keep it solid so that it doesnt melt. The only thing I would add is perhaps a makeup spatula or even an ice cream taster spoon so you don't have to get the stuff under your fingernails digging it out of the jar. Excellent work!! Love your blog, as always! I very rarely respond to blogs, but I am one that have a family that have issues with commercial deodorants, so I tried this receipe and it works great, my daughter and I found that we did sweat at certain times but no odor. I don't smell the coconut nor the 2 drops of lavender I added. I also itch at times so I will cut down on the of baking soda to see how well I do. I am still testing on myself first because I have some friends that are interested in me making them some, but I want to ensure they have a good experience. Thanks so much! Hi Tannie... Maybe you simply applied too much? It only takes a little... like a pea-sized bit or even less... just enough to be able to smooth it on. I can never SEE any after I've applied mine. My sister made some with lavender oil, and shared with me. I loved it! So I made some with bergamot and shared with her. Great deodorant. Just blogged about it. Your right, I was just excited and used too much. :-) I have since figured it out and am in love!!! I have never been so smell free. My husband keeps rolling his eyes at me because I am always smelling my armpits. So far so wonderful!!! Thanks! I have a question for you all who've made this... does it keep at room temperature for a while? No mold or funkiness? I made this and it makes a pretty big batch... will it be OK at room temperature for months? Anonymous - It should keep just fine, as the coconut oil itself is anti-fungal. I'm still using from our original batch that we made the first of April, and it's just like when we made it. Glad you like it, D! I don't keep mine in the fridge, but we usually have the AC on, so it's cool in here. Coconut oil melts at 76°, so if your home is pretty warm, you will need to refrigerate it to keep it solid. Thank you for the tutorial. I have used this recipe before, but substituted cornstarch for the arrowroot. Also, I put the finished deodorant in an old deodorant tube. I placed a link to this tutorial on my website, I hope you don't mind! Thanks for the recipe. I've used this since March of 2010. The first week off my store bought deodorant, I was smelly by the end of the day, but since then, I've not had any problems. It's great! So is it an anti-perspirant too? Anonymous, I'm glad you stuck with it long enough to find out it works. And thanks for commenting about that, so others might give it a longer try if it didn't seem to work right away. I think it took a day or two before it really worked well for me the first time I tried it, too. Kathy, it is not an anti-perspirant. However, the arrowroot powder does help to absorb the sweat to some extent. Hello, my husband and I have tried many store bought natural deodorants...Tom's, the liquid crystal, etc. I never felt they worked very well. So, we were already using aluminum free but just weren't a fan of their anti-funk properties. Tom's actually would drip if you were remotely wet under the arm. Anyway, all that to say that we are a fan of this recipe BUT we are finding that it is causing an oil stain on our shirts (and yes, we are only using a pea size amount). I'm guessing out of the bazillion commenters that we are an anomaly? Some of my husband's white shirts are a bit yellowish from it but mostly it's just like an oil stain. I have a ton of this left & will continue to be faithful to it assuming I can find a natural and easy fix for the stain. We've tried pretreating it with a vinegar spray. I've got to google some more options. Sarah, a couple of great cleaning products I like are OxyQuick and CleanAway. They take out more than just pet stains, and might be worth a try. Or look for some other enzyme cleaner at your local store. I'd spray it on as soon as you take off the shirt, and then leave it alone till you're ready to wash it whenever. I haven't had a problem with oil stains on my clothes from this deodorant, but I could experiment a little and see what works, since I have those cleaning products on hand. Email me (via my profile) if you're interested. BTW, it's amazing what little bit of that deodorant you can use and still have it work. Try cutting down even more on your amount and see if that helps. Just enough to absorb into your skin is sufficient. You don't want to feel greasy. Good luck! Post back with your results! Love, love, love this deodorant. Told a friend about this tute and she whipped up a batch for us to share. It is crazy amazing, and is the only deodorant that I feel actually works for me! Thank you, thank you. I am going to share a link to your post on facebook. If you want to make this more of an anitperspirant try using powdered Alum. Alum is used to absorb moisture to avoid chaffing. I can't wait to try this out! Thanks for posting it! To answer the question about the yellowing on the clothing and how to remove it. Sudsing ammonia added to the wash cycle instead of laundry detergent - it will remove the body oils from clothing. This also works if you have ever left a load in the washer overnight and had it sour. Wow! This is simply an amazing recipe. I didn't have grapefruit seed oil so I used 10 drops of tea tree and 10 drops of lavender. I love it- smells good and works! Thank you! I am SO surprised at how well this works. I have tried so many deodorants and can't believe how this not only works better than the natural ones, it works better than the bad stuff, too. I'm giving a batch to everyone in my family. This stuff WORKS!!! You won't be disappointed! Does anyone have any tips for how to make something similar that smells a little more... well, manly? I'm really keen to find a natural deodrant that works but I'm not sure that my wife would want me to smell like herself! You could try an essential oil that smells a little more spicy or something. Go to store and smell 'em all and see what you (or your wife) like. :) Or, you could simply leave out the essential oil. It would leave you with just a hint of coconut scent that's really not noticeable once you have it on. Good luck! We mix this up without any essential oils and it has no scent that a normal nose can detect, but I guess that might depend on the brand of coconut oil you choose. If you use a high quality oil like tropicaltraditions.com gold label, it's unrefined but has no smell. Deodorant doesn't need to be scented anyway. Thanks so much for this I made a batch this weekend and so far so good. One thing I noticed mine also set up more solidified than the picture and feels sort of gritty when applied to shaved pits. I am going to try adding 2 Tbsp of aloevera to it. But have also read that adding 30 drops of sage oil or adding witch hazel can help with sweat reduction...has anyone tried that? This is a great recipe. I put grapefruit and cedarwood oils in it, but should have used more. The coconut scent trumps all currently. Found this blog after researching my horrible burn from Tom's of Maine deodorant. Turns out there are hundreds of people being burned by it, even hospitalized. People have been complaining about it since 2006, and it is still on the shelves!!! Yes, do post back and let us know if it works for boxing! And Jess... keep in mind that any royalties go to MUM! Oh I have been using something like this from a great store but now I can make my own. If it's anything like the one I buy it will work without a doubt, my husband swears by it even in our Aussie Summer working on the farm. It WORKED!!! I've been using it all day (and I am not one who can go without a really strong anti-perspirant)... I'm still cookie-fresh. Thanks so much for posting. Wicked! I have made a batch, and it works great for me! It is not that warm in my house, (around 72degrees F/22 Celcius)..could it be that I used another brand of coconut oil? I got unraffined extra virgin coconut oil in the health store here. The coconut oil itself is solid, in its jar in the kitchen cabinet here..strange. I would really like it to be creamy as in the picture in your blog, or I wouldn't mind it being oily either, as long as it didnt separate, making it necessary to remix.. Any thoughts? BB... that 'is' kinda strange. If it's solid by itself, it should certainly solidify when mixed with the other ingredients. Have you tried setting it in the kitchen next to the jar of coconut oil, just to make sure they're at the same temperature? You could try refrigerating it, but then you'd probably get a REALLY solid chunk, although I've read where some people like that and just rub the chunk against their underarms. Mine isn't really creamy like in the photo. That was taken as we were mixing it, and it was pretty warm that day. It did solidify overnight. A later batch I've made at home here isn't creamy, either. In fact, over the winter I kind of had to dig it out, as it got a little too solid, but now as the weather warms up, it has softened. I think the coconut oil is pretty sensitive to temperature... doesn't take much change to make a difference. Do some testing, and post back to let us know how you turned out. I'm glad it at least works for you! I have been using this deodorant for a few months an d I love it. For the first time in my life I do not have to wash my bra every timeI wear it- I typically need a lot of coverage and this absolutely works for me! Thanks, Candyce, for letting us know! So glad it works for you! Thanks for posting this, I am currently trying to remove all toxins from my life and was confused what to do about deodorant for a while. I just hope to be able to find this in the local grocery store! Funny you should post this yesterday because I was just asking a colleague of mine what her recipe for homemade deoderant was. She couldn't remember the amounts of everything, but low and behold here you are with my internet search. Thank you, I look forward to trying it! Thank you so much for this!!! Not only is it a great recipe, but I'm also all the more worried about buying products here in Japan where I can't read the ingredients very well, haha. My hubby and I both tried this and it really works. Much better than all of the "natural" deodies we've tried. I just melted the coconut oil in the pan with the eo, stirred the rest of the stuff in and poured it into an old, empty deodorant container. Thank you! Great! I'm glad you like it! OK! I made this last night and used it today. I found that I needed almost an additional tablespoon of coconut oil to get it "creamy" (like in the picture) and not just a powder form. Just keep adding a little at a time until it mixes right. I used Lavender (Young Living Oil) and it smells awesome. It was 85 and humid here today and my "pit" checks all day have been good (no need for reapplication). I used to use the "rock" and found that it gave me a "wet" funny smell. Even though I was sweating today--I still smelled great! Oh Happy (no smelly pit) Days!!! OH--BTW I don't know how anyone could get a yeast infection with coconut oil b/c it is used to treat yeast infections. According to Toenail-Fungus.org, "Coconut oil contains lauric acid, a fatty acid that serves as a natural antifungal, antimicrobial and anti-inflammatory. Some coconut oils can have a very light coconut smell. Lauric acid inside the coconut oil treats external Candida yeast infections, skin irritations, nail fungal infections, athlete’s foot, and even eczema and some skin allergies." I would think cornstarch might not be the best choice. I would find the Arrowroot if you can! Thanks, Anonymous, for the info. on coconut oil. I'm glad the deodorant is working for you! Made it, ten minutes later I had a small jar filled with nicely scented cream. I used lemon oil instead of the orange oil, as I prefer the smell. It's a different kind of "freshness" that appeals to me. I usually don't use any type of deodorizer due the the lack of understanding whats inside of it, then I figured if I can make it while having fun, learning, and smelling nice, it will certainly have to be tried. Thanks for this recipe. Addind vodka is a common thing to do, and I might give it a try on the next batch. Both my husband and I (and now many of our friends) have been using this recipe for awhile and love it! Never smell, even if you go several days, and it is easy, cheap, and healthy. We add tea tree oil for its anti-bacterial properties and I add lemon to mine for the scent. I would highly recommend it. I'm headed to the store to buy the ingredients for this right now. I am also a huge fan of Soapwalla deodorant (I have a review on my blog), but I feel like I need to try this because the ingredients are so pure and simple! Hope you like it, Mary! (I'm betting you will.) Please post back and let us know how it compares to Soapwalla! I don't know that it will take out smell from previously smelly shirts, but it will certainly prevent any future smell. This stuff really works... I've been using it for a couple of years now, and I'll never switch! I'm excited to try this simple because deodorant is getting too darn expensive! I already use grapefruit EO in my hair so so wearing it as a deodorant should be quite refreshing. 8 drops clary sage, 8 drops lavender, and 2 drops each bergamot, jasmine, & lemongrass oils make this smell a lot like the baby powder scent I usually buy! Must I use a glass jar or tin? It seems must things are packaged in some sort of plastic these days. I happened to have a small jar that had pimentos pass the sell by date but if I want to make more I don't have any other jars but I do have lots of plastic containers from hair products. Plastic works great! That's what I have mine in right now. Hope you love the deodorant! Grandma G thank you for sharing this. I cannot believe this worked all day. I get up and shower around 4:30am and get home from work, when I come straight home, around 4:30pm. This held me the entire day! I actually took Degree to work with me as a back up today and did not need it at all. I kept taking a sniff to see if it was working and it's still working. I've already passed the recipe on to several co-workers who are eager to try it too! A couple of times I felt that slight tingle, you know it girls. I thought for sure, 'Ok time for the Degree'. But never once did I have to pull it out. I don't know if it was the baking soda, the arrowroot or the oil but something kicks in and locks that moisture right in. Can you spell confident? I honestly feel I could simply change my clothes, go out on the town and still stay fresh for hours! Wow, Ally... I've never had that happen, and I can't imagine why it would. The coconut oil should be solid below 76 degrees, so it shouldn't separate from the dry stuff. Are you keeping it in too warm a place? Are you SURE you used coconut oil and not accidentally something else? Be sure to let us know if you figure it out! I keep it in my bathroom... maybe it gets too warm in there, I never thought of that. I'll try storing it in my bedroom, near the window see if that helps! Thanks! I wondered if more than a year later your mom still uses it, and if you use it. I want to give it a try. I have to admit it was her project and I never switched from my store-bought Secret, but Mum still uses it every day. Yes, I do! I've actually been using it for over two years, because I'd bought some similar before that, but the Etsy seller I got it from closed her shop, so I couldn't get it anymore. That's why I came up with my own. And I'll never switch! Where did you get the cute tin? I had purchased a similar deodorant in it from an Etsy shop. That's what got me started on this deodorant in the first place... when that shop closed and I could no longer get it! I bet you can order tins on Etsy. Search in the "supplies" category. I'm going to try this, it sounds great. As for all those who commented about anti-perspirant, you need to sweat. Our bodies are made to sweat to release toxins. If the toxins can't come out they have no where to go but stay in that area, thus adding to the risk of breast cancer. My aunt's cancer doctor told her anti-perspirants are one of the worst things you can use for that very reason. Are the tins you used aluminum? If so they can absorb the very thing we are trying to avoid, why not pack in a small glass jar or for traveling or safety a plastic one and even stainless steel if you can find them. I made this deodorant and loved it, until I developed a rash under my arms =( Now I don't know what to do? Any idea what caused it? Anonymous. I read that it is important to use "food grade" baking soda. The baking soda that you buy in bulk for cleaning may cause a rash. Further investigation yielded that the only difference is in the coarseness. So just give it a whirl in a coffee grinder or use a mortar and pestal the make a finer grain. Could be the essential oil causing the rash. I react to tea tree oil with a rash. What a brilliant idea! For deodorant I have been using either just plain baking soda, or a baking soda/bentonite clay mix, or just coconut oil. But I never thought of combining the coconut oil and baking soda. The essential oil is a great addition too. Essential oils are anti-bacterial, but so is the coconut oil. I can't wait to try this! Thanks for coming up with the recipe and sharing it. I just saw the comment above by lyndapaz about using food grade baking soda and it reminded me that there is also an aluminum-free baking soda, which would be a good idea. That's what I use for food, brushing my teeth and my deodorant. Red Mill the brand that I use, but there are probably other brands as well. So presumably most commercial baking soda contains aluminum unless it's specifically labeled as "aluminum-free baking soda"
I finally got around to making this (after about a year). Everyone in the household loves it, from teen to husband! It's a keeper. I tried this and it works very, very well!! Way better than store bought deodorant! Very happy with this recipe, wouldn't change a thing. Coconut Oil is an antifungal, ie kills yeast. I just read that refined coconut oil will stain clothing. I wondered why some people complained that this deodorant stained their clothes when it has never stained mine. Perhaps the recipe should read, "4 tablespoons unrefined coconut oil" so no one makes the mistake of using the refined stuff. Thanks, kc. I actually didn't know there was a difference in coconut oils. All I know is that mine has never stained, either, and it is indeed unrefined. What do you think, Jess... change the recipe? I'm not sure if anyone still reads this or updates it, but I was wondering if instead of EOs (essential oils) I could use perfume oils to scent the deo? I'm super super excited to try this recipe! just found this blog so wanted to answer and EO question I read. If you use Tea Tree oil it has antibacterial properties so it is find to use. you shouldn't use perfume or fragrance oils on the skin. made this just now and can't wait to use it in the morning. I did tweak it just a bit, I didn't have arrowroot in the house (yet) so I substituted corn starch and used Tea Tree and Lavender EO's as my grapefruit seed EO hasn't arrived yet. weird thing happend to me and a friend of mine, i have been using this for a few months and while it is amazing stuff, my pits have changed colors, they are now very dark and let me say kind of ugly.. any ideas why.. I'm going to try this for sure and so happy that I have all the ingredients in the house! By the way - I wanted to pin this but the pin button doesn't work nor does my pin it in my bookmark bar....too bad.